The trial attorneys at the Brannon Law Firm have a successful track record in representing personal injury victims in Ohio since 1975. Over this period of time, we have recovered hundreds of millions of dollars on behalf of our clients. This has included numerous individual jury verdicts and settlements in excess of $1,000,000. Our success in the courtroom stems from our law firms objective to provide each injured client with the highest quality legal representation. This is mirrored in our willingness to take your case to trial if the wrongdoer is unwilling to pay a fair amount to settle the case. In brief, we are knowledgeable, experienced and ready to fight for you! A person may have a claim for a personal injury where they have been injured as a result of the negligence or wrongdoing of another person, company or other entity. These incidents often exact an enormous toll on the victims and their families who may need to seek recovery for medical expenses, lost income, lost earning capacity, pain/suffering and other damages. These injuries can occur in a variety of accidents including automobile accidents, motorcycle accidents, dog bites, defective products, slip and fall, pedestrian accidents, truck accidents and workplace accidents just to name a few. Our attorneys have handled a vast array of personal injury cases and can help determine if you have a case no matter what the manner of injury. 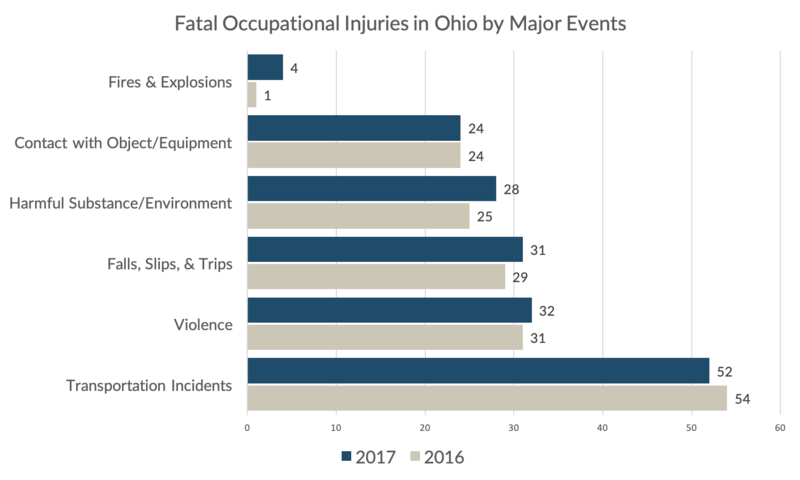 According to the Ohio Bureau of Workers’ Compensation, the year 2017 saw a total of 174 fatal occupational injuries cases recorded in Ohio, marking a 6 percent increase from 2016’s 164 reported fatal occupational injury cases. 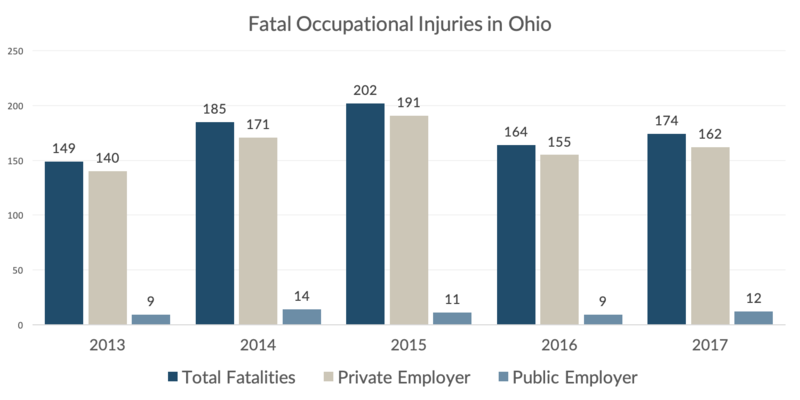 162 fatal injuries out of the 174 total cases in 2017 occurred in the private industry, public employers saw the least amount of fatal occupational injuries with 12 reported cases for the year 2017. 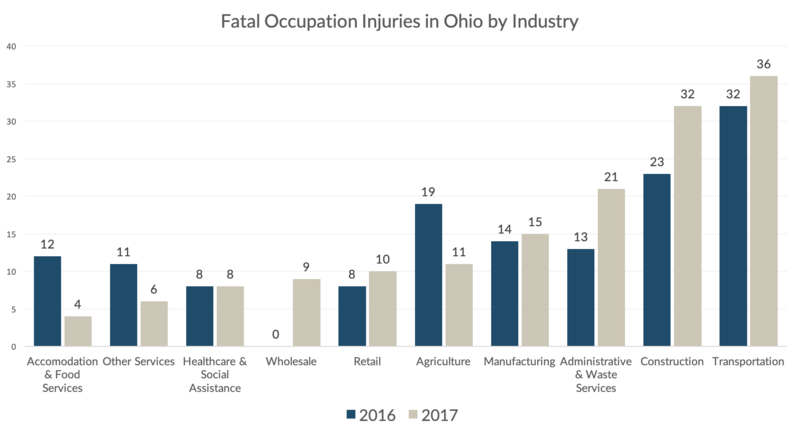 To better understand the data presented, we looked at fatal occupation injuries in Ohio divided by industry. The construction industry saw a large jump in fatal occupation cases between 2016 and 2017 with a 39% increase from 23 to 32 cases reported. The Administrative & Waste Services industry saw the sharpest increase of 62%. Increasing from 13 cases in 2016 to 21 cases in 2017. Some industries recorded significant decreases in fatal injuries as well. Including the Agriculture industry going from 19 cases to 11 cases in 2017, and the Accommodation & Food services industry from 12 cases in 2016 to only 4 by the end of 2017. We also saw a good decrease from 2016 to 2017 in reported cases with the events: Harmful Substances (28 cases to 25 cases), and Fires & Explosions (4 cases to 1 case). Men accounted for 152 cases of the total 174 recorded fatal occupational cases (87 percent), a decrease from last year’s 91 percent of all cases. The age group with the highest percentage of fatal industries is the 55 and older group, with 66 fatal injuries in 2017 accounting for 38 percent of the total number of fatal injury cases. There was a spike in pedestrian vehicular incidents causing injuries in 2017 with 15 cases. This represents a 36 percent increase from the year 2016. Over the past few decades, we have represented personal injury victims and have come to understand the daunting task people face in choosing an attorney to represent them and their families. This is just one reason the Brannon Law Firm does not charge anything for an initial consultation. Our personal injury attorneys are available to meet with you at our office, your home or even in the hospital. Additionally, if we do choose to take your case we can work on a contingency fee agreement. This means that we do not charge any fee unless the case is successfully resolved in our clients favor. Contact us to see how we can help you make a recovery for your personal injuries.